Andy who? He’s the top marketing guy at Dell and during a recent interview with CIO Australia he totally predicted doom for the iPad, claiming the device was too expensive for its own good. But wait, there’s more! 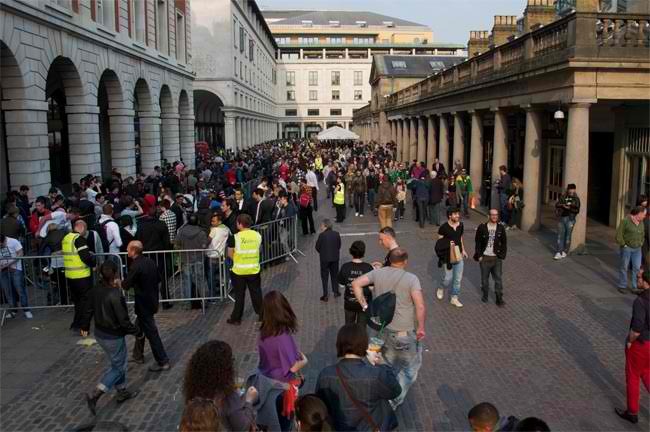 The picture below depicts Londoners eagerly waiting for the iPad 2. According to Dell’s Andy Lark, Apple’s explosive success won’t matter in the long run. Apple is great if you’ve got a lot of money and live on an island. It’s not so great if you have to exist in a diverse, open, connected enterprise; simple things become quite complex. …Our strategy is multi-OS…We will do Windows 7 coupled with Android Honeycomb, and we’re really excited. We think that giving people that choice is very important.